I always look forward to this opportunity to see new works and works-in-progress from experienced and emerging playwrights. The festival runs for three weeks and each week the format is the same; three or four short pieces make up the main program with a rehearsed reading of a new piece on Saturday at noon. The program is different each week. The third week began on Wednesday evening and the festival closes on Sunday. The plays are all in various stages of development. The playwrights have an opportunity to see their work performed on stage with actors and a set and to gauge the audience’s response. The also get direct feedback from the audience because there’s a survey inside the program. You fill it out and submit it at the end of the show. People are quite serious about their responsibility. They were filling in the surveys at intermission and at the end of the show. There are three questions. What engaged you in this story? Was anything unclear? Is there a character you would like to see more developed? It seems to make sense to keep them in mind as I write about the plays I saw. Best title! Marsha wants to open an Italian restaurant but her husband Tom ‘puts his foot down’ and say no. She develops a lasagne with a secret ingredient. Will Marsha’s dream come true. To me it felt as if this was part of a longer piece. It also felt as if it was early in the development process. I loved the premise but it didn’t engage me. It felt as if the play hadn’t found its identity yet. I couldn’t really tell if it was a comedy, a drama, or a cautionary tale. There was a strong feminist message but there were a number of other themes that were touched on. I would have liked to see them fleshed out. That’s part of why it felt like it was part of a longer piece. “Three mothers share their anxieties, fears and isolation in a support group”. I really enjoyed this. I think anyone who’s given birth would relate to it, in fact any parent would probably relate to it. Direction and staging really add to a piece like this. 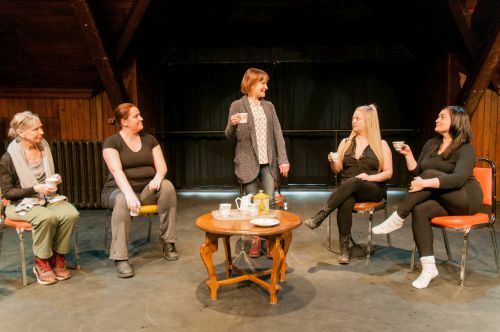 Director Cassidy Sadler has the women moving around on the stage, sliding small boxes around, and using a stuffed bear as a talking stick which gives the piece visual interest. Even though there are three named characters their dialogue is interchangeable; it doesn’t serve to develop the characters. They’re all every-woman. Alice has move to a small town and wants to make friends. She decides to start a book club to meet other culturally minded women. I loved this. It felt pretty far along in the development process, pretty much ready for prime time. The dialogue is wonderful; natural, witty, and fast. There are five characters in the book club and they all felt fully developed. Director Marley Kajan has given us a delightful play. It’s 35 minutes long. I can see it quite easily being extended to 60, maybe even 75. The New Ideas Festival is an opportunity to see theatre you might not otherwise see. New works, at various stages of development, by both experienced and emerging playwrights. It’s a pretty risk-free way to move a little bit outside of your comfort zone if you haven’t gone to this kind of thing before. Performances are Thursday through Saturday at 8:00pm and Saturday and Sunday at 2:30pm. The rehearsed reading is Saturday at 12:00 and requires no reservations.